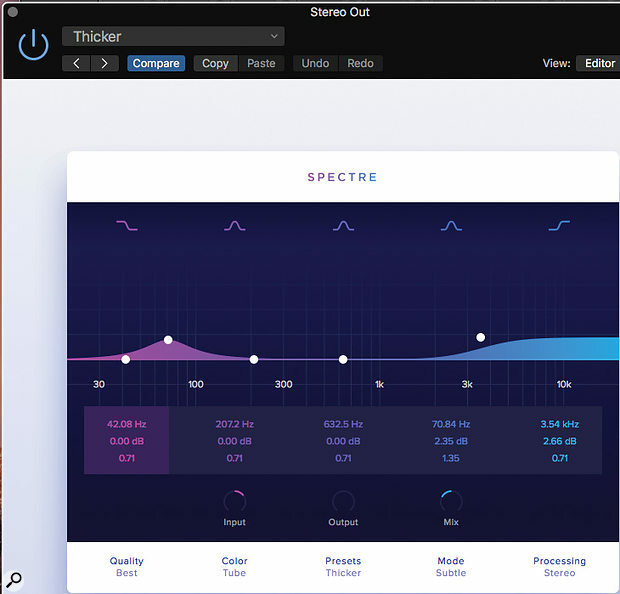 Spectre is an enhancer plug‑in that can target specific parts of the audio spectrum, presenting a user interface that operates much like a five‑band, boost‑only parametric equaliser. There’s a choice of eight different saturation algorithms, and Wavesfactory have also included 4x and 16x oversampling modes to keep the processing as pristine as possible. Spectre is a parallel processor, with a Mix control that balances the ‘warmed’ signal against the clean signal, and as well as the saturation algorithms — Tube, Warm Tube, Solid, Tape, Diode, Class B, Bit (reduction) and Digital — there’s also a Clean setting that allows it to be used as a parallel EQ. Further control over the character of the saturation is available courtesy of a three‑way selector with Subtle, Medium or Aggressive options, and the input volume parameter also affects the amount of saturation. In addition to the usual mono and stereo processing modes, there’s a Mid‑Sides option, which can be a very powerful ally in lifting sounds out of the centre of the mix or adding glitter to the stereo extremes; however, the current version can process only the mids or only the sides, not both independently. While the user interface is very straightforward, there’s no metering that shows the degree of harmonic enhancement taking place. The best strategy seems to be to turn the Mix control to 100 percent wet so that you can hear only the processed signal while making adjustments, then back off the Mix until the combined signal sounds right. I was curious to see if Spectre could produce similar results to my Drawmer 2476, which includes a three‑band saturation section that I find very useful. That device uses crossovers to separate the signal into sharply defined frequency bands, then processes each separately. Spectre works rather differently, but there’s certainly some common ground when it comes to subjective results. For mastering, the tape and tube algorithms seem to work best, but the harsher diode or bit‑reduction settings can be effective for crunching snare drums and the like. Diode produces the ugliest sound (sometimes in a good way), and works better on high frequencies than low frequencies. When mastering, I often treat the lows and highs while leaving the mid‑range clean, and Spectre accommodates this way of working, allowing you to subtly fatten the bass end and to add air to the highs. The Subtle or Medium saturation settings seem to give the most musical results. In some situations, it might be beneficial to use Spectre in combination with conventional EQ, as adding a lot of processing in one part of the spectrum can leave the other parts sounding slightly out of balance. For example, if you enhance just the highs and lows, you may need to pull down the levels of those regions slightly using EQ, or boost those clean mids. Most of the limitations mentioned here are on the road map for updates but even in this early version, Spectre is a very powerful plug‑in, both for treating individual tracks and sweetening complete mixes.